No spooks in this forecast tonight, but there will be a lot of chilly air! Despite the sunshine this afternoon the northwest wind will keep things rather chilly today. Temperatures will rise near 50° early this afternoon and then fall into the upper 40s by the time all the ghosts and goblins begin to appear on the streets. Once the sun sets, however, the mercury will drop into the the upper 30s by 7pm. Make sure those little ones have everything they need to keep warm: hat, gloves and scarf. You may not be able to see the costumes very well but at least they'll be warm. Have fun and stay safe! It was a busy afternoon for our weather department. This afternoon, we hosted the National Weather Service's annual fall meeting for all the local media outlets in here in Rockford. We went over the Winter 2012/2013 Outlook focusing on the current weather patterns: La Nina/El Nino, previous winters and what they can tell us about this winter as well as other atmospheric patterns that could lead to a cold vs. warm winter season. Also discussed was the importance of social media and how fast information can spread via twitter and facebook. Perfect example of this was Hurricane Sandy. The NWS also said as of right now, warnings will not be distributed through twitter. This may change in the future but as of right now updates will remain just that, updates on the weather. 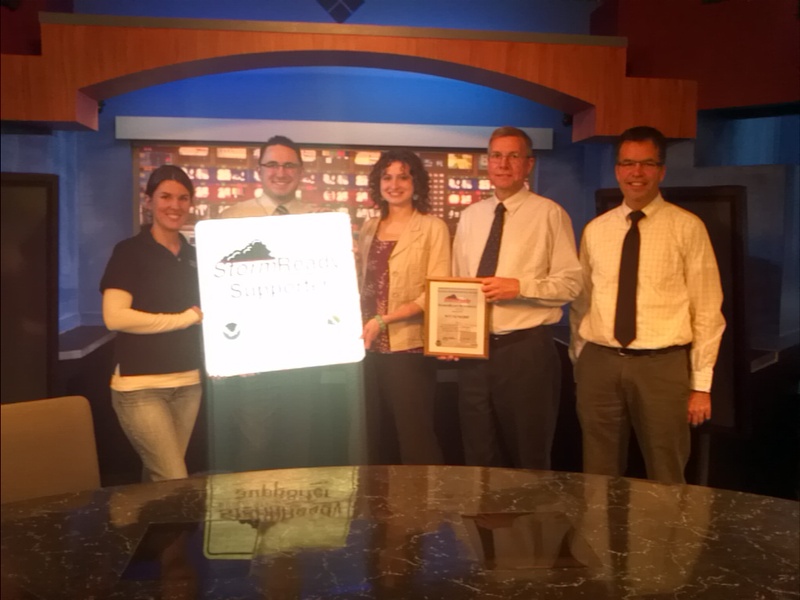 ﻿﻿ It was a very important day for us at WTVO/WQRF because we became one of the first local television stations to be recognized as StormReady. Brandon, Eric and myself felt very honored to be recognized for being ready in the event of severe weather but also being recognized as having a safety plan for the employees of the station should severe weather threaten the station. Jamie Enderlen, General Forecaster with the Chicago NWS, says "WTVO/WQRF supports the spirit of the StormReady program by having redundant methods of receiving severe weather warnings and weather information from the National Weather Service". We have several NOAA Midland weather radios, the use of the NWS Chat, trained storm spotters at the station, hold annual weather watcher meetings and will soon begin to conduct tornado drills for all staff. These are all very important things when working to keep not only the public, but staff, safe during severe weather and we work very hard to make sure every employee knows what to do both inside the building but also while out in the field. If you would like to learn more about the StormReady program and how your business can get involved click here. If you looked overhead yesterday afternoon you may have noticed a cloud shield moving in from the east. That was actually from Sandy which at the time was still out in the Atlantic Ocean! These higher altitude clouds, known as cirrus/cirrostratus clouds, can extend well out in advance of an approaching storm system and despite them covering up the entire sky are often times transparent. Cirrus clouds are made up of thousands of tiny ice crystals because they form at a height that is well below freezing. 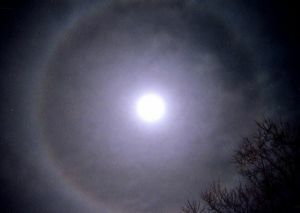 The 'halo' is formed by the refraction, or splitting of light, and also by reflection from the light of the moon. Now, the ice crystals have to be positioned just right with respect to eye in order to be able to see the halo but when you do it's a pretty neat phenomenon. There's an old weather saying, "Ring around the moon means rain soon". There is actually some truth behind this because cirrus clouds can form a couple days in advance of an approaching warm front because the air ahead of the front is lifted at a slower rate than air ahead of a cold front allowing the cirrus clouds to form. One word comes to mind when looking at a visible satellite image of the east coast, WOW! The cloud shield from Sandy extends from Canada all the way down to Georgia and South Carolina just showing the magnitude in size of this storm. In fact, the western edge of the cloud shield extends into the Great Lakes and will keep filtered sunshine over northern Illinois and southern Wisconsin through today, tonight and a little into Wednesday. Also along the outer edge of the storm are the strong winds noted through the Great Lakes. Gale Warnings, Storm Warnings, High Wind Warnings and Lake Shore Flood Warnings continue for the areas surrounding not only Lake Michigan but also the other lakes. Earlier this morning a section of I-90 was closed in northeast Ohio due to water running over top and into rivers from Lake Erie. Wind gusts this afternoon will remain near 35-40 mph across the Stateline but higher gusts will be found to the east closer to Chicago and northwest Indiana. Gusty north winds continue into Wednesday before what's left of Sandy moves into eastern Canada. Hurricane Sandy has been making her presence known up and down the east coast and will continue to have a devestating impact on the mid-Atlantic and Northeast for the next couple of days. With strong winds over 90 mph, beach erosion, coastal flooding, high storm surge, damaging winds gusts, inland flooding, power outages and even heavy, wet snow...Sandy is not holding back anything! Further west the effects of Sandy will be felt across the Great Lakes with an increase in the wind, beginning later today and lasting through Tuesday night. Wind gusts near 50 mph are expected near the shores of Lake Michigan this afternoon with an increase potentially to 60 mph by Tuesday. With a full northerly fetch down Lake Michigan the strong winds could cause wave heights between 20-25 feet, especially for the southern shores in northwest Indiana and riding near Cook County in Illinois. Storm Warnings, Gale Warnings and Lakeshore Flood Warnings have all been issued for the counties surrounding the southern tip of Lake Michigan. Not only will the winds impact Lake Michigan but the other lakes as well. Flooding could be possible for local bike paths and even Lake Shore Drive in Chicago. Closer to home winds won't be as gusty but there will be occasional wind gusts near 35-40 mph. Hurricane Sandy has been holding her own the past several days as she inches closer and closer to the northeast coast. Still a category one hurricane winds remain sustained at 85 mph with a current movement to the north/northwest around 20 mph. The central pressure recorded earlier in the center of the storm was recorded at 946 mb a record tying all time low pressure. Sandy remains over 250 miles offshore but is a very large storm. Heavy rainfall has already been battering the northeast with water rising so far this morning between 2' to 3' from Long Island to New York to New Jersey. Rainfall in excess of eight inches will be possible with hurricane force wind gusts expected from Atlantic City northward into Massachusetts late this afternoon and evening. Sandy is expected to make landfall this evening in New Jersey with the strongest of the winds felt just to the north as winds could possibly gust as high as 75 mph, or higher. Once onshore Sandy will begin to slow down significantly only prolonging the heavy rain, wind, flooding and even heavy snow for the higher elevations of Virginia, West Virgina and North Carolina. The large magnitude of this system will cause gusty winds across the Great Lakes later Monday evening and Tuesday afternoon. It won't be until later this week before the atmopshere begins to calm once Sandy moves north. One (NJ) cousin said she taped the big windows on her house on Saturday. She said on Saturday the stores were running out of bread, milk, and other staples on Friday. She and her husband bought a portable electric generator. They went to Lowe’s, Wal-Mart, and other big-box stores and all were sold out. They found one at a small privately owned hardware store a few blocks from where they live. They didn’t think the store was gouging them. They also installed a sump-pump. In some storms, wind pushes rain against one side of a house and the water travels down and enters the basement. This can happen even with houses on high ground. My cousin said there were lines at gas stations. She said people were short tempered, arguing but not throwing punches…yet. Another NJ cousin said she and her family weren’t doing anything special – no boarding or taping windows or over buying food. They have plenty of canned goods. She said on Sunday, they went to several supermarkets to buy water and all of the stores were sold out. Milk and bread were gone too. They had major excavation work done in their backyard this summer so they will be watching for flooding. Fortunately, they don’t have a basement but water could damage the foundation. She said schools are canceled for Monday and Tuesday. She is more worried about the snow on the backend of this storm. She said the NJ governor doesn't want people wandering around after the storm hits. A third cousin and his wife live on a boat (cabin cruiser) in Chesapeake Bay near Baltimore. They were going to pull the boat out of the water but decided on Sunday to move it 100 miles up a river. They double tied it at a marina and then left to ride out the storm with their daughter in Salisbury, Maryland. PORTSMOUTH, Va. — The Coast Guard rescued 14 people from life rafts in the Atlantic Ocean approximately 90 miles southeast of Hatteras N.C., Monday, and two people remain missing. Watchstanders dispatched crews aboard two MH-60 Jayhawk helicopters from Coast Guard Air Station Elizabeth City, N.C., to rescue the crew. The first Jayhawk crew arrived on scene at approximately 6:30 a.m. and hoisted five people into the aircraft, and a second helicopter arrived and rescued nine people. The 14 people are being flown to Air Station Elizabeth City where they will be met by awaiting emergency medical services personnel. The C-130 Hercules aircraft remains on scene and is searching for the two missing crewmembers and a third Jayhawk crew is en route to assist search and rescue efforts. PORTSMOUTH, Va. — The Coast Guard has received word that the crew of the HMS Bounty has abandoned ship approximately 90 miles southeast of Hatteras N.C., Monday. The 17 person crew donned cold water survival suits and lifejackets before launching in two 25-man lifeboats with canopies. The Coast Guard continues to monitor the situation and assess the weather conditions to determine the soonest Coast Guard aircraft or surface assets can be on scene to conduct effective rescue operations. Coast Guard Sector North Carolina initially received a call from the owner of the 180-foot, three mast tall ship, HMS Bounty, saying she had lost communication with the vessel's crew late Sunday evening. The Coast Guard 5th District command center in Portsmouth subsequently received a signal from the emergency position indicating radio beacon registered to the Bounty, confirming the distress and position. An air crew from Coast Guard Air Station Elizabeth City launched aboard an HC-130 Hercules aircraft, which later arrived on scene and reestablished communications with the Bounty's crew. The vessel was reportedly taking on water and was without propulsion. On scene weather is reported to be 40 mph winds and 18-foot seas. There is a log jam in the flow of weather systems. An area of high pressure is blocking the movement of Hurricane Sandy off the mid Atlantic coast. The jet stream is snaking around, and is expected to force Sandy to the north, then northwest, and finally to the west/northwest during the next 36 hours. With Sandy backing into the Delaware Bay/southern New Jersey area, Canadian high pressure will remain off to the northwest of the Stateline feeding a chilly northerly breeze into the area for the next several days. High temperatures will be in the upper 40's to around 50 degrees Monday through Thursday, and low temperatures will be in the upper 20's to around 30 degrees for the same period. There will be plenty of sunshine to, but you will be well aware of the chill in the air. By Friday the remnants of Sandy will kick off to the northeast into southeastern Canada. The Canadian high pressure ridge will move to the east, and a southerly flow will develop bringing seasonal temperatures in the middle 50's back to northern Illinois. A new weather system moving eastward from the plains might even scatter some showers into the area by next Sunday. The chilly weather pattern will continue through the middle of next week with highs in the upper 40's and lows in the upper 20's. Temperatures will average about 10 degrees below normal for the next 4 days followed by a warming trend that will slowly lift temperatures back up into the middle 50's by next Saturday. Little if any precipitation is expected. The major news weather wise for the country will be the evolution, and movement of Hurricane Sandy along the east coast. Numerical models are indicating the development of a super storm that will be a hybrid of sorts that will hit the mid Atlantic coast near the Washington DC, Baltimore, Philadelphia area on Monday night or Tuesday. Numerous states of emergency have been declared well in advance of land fall in Maryland, Delaware, eastern Virginia and eastern Pennsylvania for wind damage, power outages, storm surge in coastal areas, and flooding from heavy rains. There is even the possibility of heavy wet damaging snows of 1 to 2 feet across parts of the West Virginia mountains above 2,500 feet. At 1:30pm Saturday afternoon FEMA, the National Hurricane Center and the National Center for Environmental Prediction held a media press conference regarding Hurricane Sandy and its significant impact on the Mid-Atlantic and Northeast. -This is a complex storm and will cover a large geographic area. -Preparations are currently taking place for coastal surge, flooding (both coastal and inland), massive power outages and even winter weather further west. -We are expecting this storm to make a transition from a tropical system to a non-tropical system or post-tropical system while still out in open waters or right before landfall. This is why Tropical Storm Warnings and Hurricane Warnings do not extend further north than the Carolinas. We don't want to confuse the public with the warning of this storm. It's week one of the IHSA football playoffs, and it's going to be chilly one. There are a few games going on this evening, including home games at Harlan and Rochelle. Bundle up if you're going out! Mostly clear skies will help temps cool off fast this evening. Kickoff highs will be in the low 40s, with temps in the mid 30s by the time these games wrap up. Everyone else is scheduled to play on Saturday, but don't expect things to be much warmer. Kickoff temps for the first wave of games (around 1pm) will be in the low to mid 40s. Plenty of sunshine will warm us into the upper 40s by late afternoon. Good luck to all our Stateline teams competing in the playoffs this year! A strong cold front moved through the Stateline earlier this afternoon, and the changes in our forecast followed quickly behind it. The first thing many of us noticed with this afternoon's cold front is a HUGE drop in temperatures. We're talking around 20 degrees in one hour for many spots. Temps as of 6:00pm are in the 40s areawide, with overnight lows dipping into the low 30s. The other change with our cold front has been the showers and thunderstorms that moved in behind it. 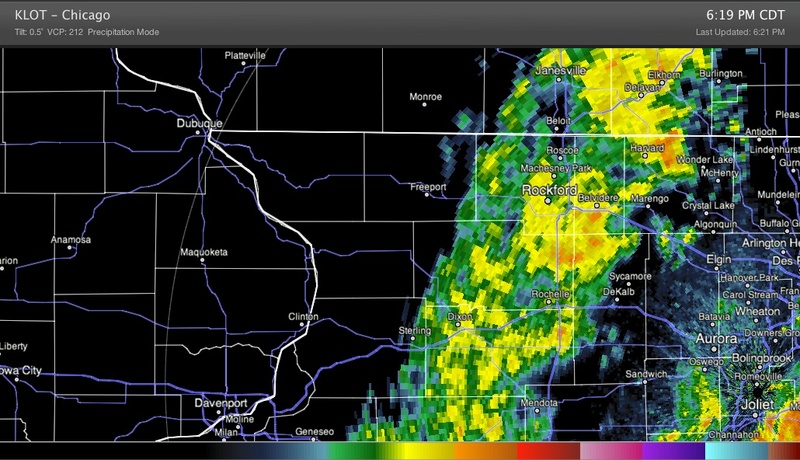 Radar as of 6:20pm shows plenty of rain across the central parts of the Stateline. It will take a few hours for this line to move out, but once it's gone, we'll looking dry for the long term. Don't expect the forecast to change much once we get this weather maker out of here later tonight. The long term forecast is calling for sunshine and chilly temps starting Friday and going through much of next week. Strong cold front currently sits just west of the Mississippi River with thunderstorms beginning to develop near Dubuque, IA and quickly racing northeast, around 75 mph. Quarter and dime sized hail have been reported near Dubuque with these fast moving storms so far and I expect further development south along the front with those storms impacting the Stateline later this afternoon. Temperatures will quickly drop 10-20 degrees within a few short hours once the front passes. Temperatures Wednesday afternoon warmed into the upper 70s/low 80s under partly cloudy skies and a gusty southerly wind. It was a beautiful day but the winds of change are coming this afternoon and so are the colder temperatures. It's going to feel a lot different later this afternoon than what we're experiencing this morning, so make sure you have your jacket with you. A strong cold front sits just to the northwest of the Stateline from Wausau, WI to Cedar Rapids, IA into western Missouri. Rain and thunderstorms have been forming right behind the front with snow falling further west in the heart of the colder air. Temperatures will briefly rise into the low to mid 70s around Noon ahead of the cold front but once the front passes we'll lose 10-15 degrees within a couple hours and then drop a couple degrees every hour into the evening. Temperatures will fall into the 50s by 5pm with the 40s by 6pm. Thunderstorms will also move in from west to east beginning around 1pm to the west and move across northern Illinois and southern Wisconsin into the evening. A heavier band of rain and thunderstorms may occur around 5pm/6pm as stronger winds in the jet stream move out of Iowa and into Wisconsin. This may cause some of the rain to increase in intensity through the evening before ending around midnight. We'll drop into the 30s tonight and only rise into the upper 40s and low 50s by Friday. The latest model runs show Hurricane Sandy moving a little further east as it creeps towards the United States, which is great news for everyone heading into next week. Here is what we call a spaghetti graph. It shows several different models and their predictions of Sandy's possible path. While some models have the hurricane hitting the east coast next week, many models now have the storm moving out to sea over the coming days. The latest National Hurricane Center Forecast is still playing it safe. It has Sandy moving up the east coast over the weekend, which doesn't completely rule out a possible swing to the west. Another model run we'll have to keep an eye on is the European model. It's been pretty consistent about Sandy making landfall on the east coast. In fact, the run from this afternoon has the storm hitting the Virginia coast sometime Monday morning. Since some of the models have changed their minds from this morning, we'll have to see if this model does the time. If Sandy does stay west, it would act as a road block for any other weather systems trying to get through. That means whatever weather we see over the weekend could stick around a little bit longer. In this case we're talking about sunny and cool weather. The end of the month is not looking pretty for the Northeast Coast with potentially a very large storm system impacting New York by Tuesday. We'll talk more about that in just a bit. First, I want to get to the weather for today. Cloud cover from this morning has partially cleared and temperatures have responded nicely. We're already sitting in the low 70s at 11am and I think we have a decent chance of hitting 80° this afternoon. The record high for today is 80° which was set back in 1963. Don't get too used to it because as the old saying goes, "all good things must come to an end" will apply for us Thursday when a cold front moves through. The front currently stretches from northern Wisconsin southwest near Des Moines, IA. A few rain showers have been occuring back behind the front and thunderstorms are expected to develop later this afternoon and evening as an upper level low moves through the Midwest. As the front marches east tonight and Thursday morning cloud cover will increase with thunderstorms moving in after Noon for northern Illinois and southern Wisconsin. Once the front passes the cold air funnels in behind with temperatures dropping into the 40s and 50s for the weekend. As I talked about in the previous post Tuesday the potential for the colder air to stick around through end of October looks like it may happen. Now, let's discuss the potential for 'one of the biggest storms to hit the northeast' forecast for next week. Hurricane Sandy sits just south of Jamaica with sustained winds (as of 11am) of 80 mph, central pressure of 973 mb and moving north/northeast around 13 mph. Sandy is expected to make landfall in southeast Jamaica this evening, move over eastern Cuba Thursday and then into the western Atlantic by Friday. Tropical Storm Watches have already been posted for the east and southeast coast of Florida with further watches likely being extended northward up the coast in the days to follow. The weather forecast models are still diverging on the track of this storm once it enters into the Atlantic with the European model still forecasting one of the biggest storms to hit the northeast coast slamming into New York Monday night. This would mean a significant wind and rain event from North and South Carolina northward. The GFS model, however, still continues with its slightly eastward track into the Atlantic Monday night with landfall further north and a couple days later. The overall hemispheric pattern features a trough of low pressure over the Great Lakes with a blocking ridge of high pressure over the Canadian Maritime and North Atlantic which makes me think the forecast from the European model may be a little far fetched, but it's usually the more consistent of the two when forecasting storm systems. Another interesting feature that developed with the latest runs is the possibility of the low retrograding back west into the eastern Great Lakes by Tuesday night/Wednesday morning. Either way the East Coast will need to brace for strong winds and heavy rains likely to impact beginning this weekend. Tropical Storm Sandy formed south of Jamaica Monday afternoon and is expected to develop into a Category One hurricane and impact Jamaica by Wednesday morning. With sustained winds of 50 mph, Sandy is currently moving to the north/northeast very slowly around 5 mph. Once out of the Caribbean late this week all eyes will be watching to see just where exactly Sandy moves once in the Atlantic. While the current National Hurricane Center forecast track has the system losing hurricane status and weakening into a tropical storm the impact felt across the East Coast this weekend could be significant and mean a longer cold spell for the Midwest and Great Lakes. A dip, or trough, in the jet stream is expected to bring well below normal temperatures for Friday, Saturday and Sunday. The current track for TS Sandy from the American GFS weather model has the system east of Florida Friday but back out to sea by Saturday and Sunday. While this would likely mean an increased risk for rip currents and a few showers due to onshore flow for the east coast, the weather pattern would remain progressive and allow for the cold air in the Midwest to depart a little more quickly to the east. On the other hand, the European weather model has the complete opposite and a full blown out storm system impacting the east coast by late weekend. This would cause a block in the jet stream and keep the cold around longer next week for the Midwest and Great Lakes. The official forecast track from the National Hurricane Center does have a little more of an eastward track once the system enters into the Atlantic by Sunday meaning a likely more progressive and quickler flow in the jet stream. Time will tell, I guess. 11:30 am Update: The clouds, showers and fog will stick around through the majority of the afternoon and it won't be until late this afternoon conditions will begin to improve. Visibility will remain a concern today with dense fog likely developing once again tonight. Dense fog has developed this morning with visibility dropping below 1/2 mile across far northern Illinois and southern Wisconsin. The fog will get worse this morning before the visibility improves slightly by late morning. With a warm front just south of the Wisconsin/Illinois skies will remain foggy and cloudy. A weak disturbance moving out of Missouri will lift into central Illinois by noon with the continued threat for drizzle and showers today. Heavy rain and a few thunderstorms this morning is giving us plenty of fuel for fog development tonight. In fact, we're seeing fog popping up across the Stateline as we speak. Here are visibilities as of 5:00pm. Fog is expected again tomorrow night, so just be careful driving around the next couple of days, especially at night. Slow down and stay safe! Thunderstorms developing along a warm front will continue to drift northeast Monday morning but this won't be the only threat for rain/storms this week. High pressure in the southeast will keep the jet stream winds almost over top Iowa, Illinois and Wisconsin for the next few days. A warm front draped directly over northern Illinois this morning has been the focus for thunderstorm development with the leading edge of the storms moving into northwest Illinois. Storms will continue to move northeast through early afternoon with a few lingering showers lasting into the evening. Once the warm front moves into Wisconsin later today the threat for rainfall or storms will decrease. You can see the greatest chance for storm activity will be this morning and afternoon with only a slight or isolated threat developing Tuesday and Wednesday. The reason for this is with the warm front north of the area there will be no real trigger mechanism for storm development. That is not until Thursday when a cold front comes through. Not only will temperatures rise behind the front the next few days but the moisture will increase as well. Already if you were to step outside you would notice a cool, but damp feeling with the humidity creeping up. Dew points will rise into the upper 50s/low 60s the next few days which will keep overnight lows very mild but also allow for haze and fog to form. For late October standards it will feel fairly humid these next several days. Rainfall amounts won't be in short supply either; especially with what's coming through Monday morning. Rainfall totals through the middle of the week could near an inch or so for northern Illinois and southern Wisconsin. Definitely some much needed rainfall coming these next few days. A line of thunderstorms in Iowa west of Cedar Rapids and Iowa City will continue to lift north/northeast this morning around 35 mph and enter into northwest Illinois around 10am. Severe weather is not anticipated but should the storms hold together as they cross over the Mississippi River heavy rainfall, frequent lightning and maybe even pea sized hail will all be possible. Look for the storms to continue through the early afternoon. A very warm pattern is setting up for northern Illinois through Thursday with temperatures reaching the 70's Tuesday, Wednesday, and Thursday. In fact, it is even possible that 80 degrees could be reached on Tuesday, or especially Wednesday, if there is enough sunshine. A strong cold front will bring an end to the warm temperatures with frontal passage on Thursday night. Canadian air will follow in behind the cold front on Friday dropping high temperatures back into the low 50's. On Friday and Saturday, with the core of the cold ridge of high pressure well to our west over the plains, a chilly breeze from Canada with keep high temperatures in the mid to upper 40's on Friday, and only in the middle 40's on Saturday. There is still a very great need to replenish the shortage of moisture developed during the ongoing drought. So, what are the chances of getting some good rainfall this week? A front will stall out just to our northwest on Monday as low pressure develops on the front over the central plains, and moves toward the northeast. A strong fetch of moisture will be feeding northward out of the Gulf of Mexico northward into the Stateline. There is a slight chance of some showers, and possibly a thunderstorm developing late on Sunday night. It will be cloudy on Monday, and showers will be likely. Thunderstorms are also possible. It will be cloudy, warm and muggy on Monday night with a good chance of more showers and thunderstorms. With all the moisture in the area, there may be some patchy fog. Scattered showers and thunderstorms may linger through the morning hours on Tuesday. There will be a good chance of showers and thunderstorms again on Thursday and Thursday night with the passage of a strong cold front. Early estimates for rainfall totals this coming week are around one inch. Caution is advised, through, because sometimes this computer generated estimates are way off the mark. High pressure will provide clear skies overnight, but with plenty low level moisture, and light winds there could be some patchy fog tonight that may persist until around 8 am on Sunday morning. With high pressure shifting off to the east, a southerly wind will develop under mostly sunny skies warming temperatures up into the upper 60's by mid afternoon. A front will settle into the area on Sunday night bringing some showers, and possibly a thunderstorm, across parts of northern Illinois after midnight. The front stall out just to the north of the Stateline on Monday, a good southerly wind flow will develop northward from the Gulf of Mexico, and there will be a good chance of showers and thunderstorms through Monday night. The high on Monday will be around 71 degrees, and it will be very mild overnight on Monday night with a low in the low 60's. The front will still be very close by on Tuesday, so it will remain mostly cloudy with a slight chance of showers. There will be scattered showers on Tuesday night, and it will continue to be very mild with a low again in the low 60's. The front that had been hanging around for a couple of days will pull off to the north across Wisconsin, as a warm front, on Wednesday. It will be partly sunny and very warm with a high in the middle 70's. Showers and thunderstorms will develop on Wednesday night in advance of a cold front moving toward the area from the northern plains. The showers and storms will continue on Thursday as the cold front moves across northern Illinois. Considerably cooler air will move into the upper mid west late next week with highs on Friday dropping back into the middle 50's, and highs on Saturday only in the upper 40's. If you haven't heard already, the Orionid Meteor Shower is going on this weekend. This is a yearly event that occurs when the Earth passes through the debris trail of Halley's Comet. You'll have to set the alarm clock, though, to see it this year. The best viewing time is early Sunday morning before sunrise. The forecast is looking ideal for seeing the meteor shower. We're calling for mostly clear skies Saturday night and with most of the moon dark, meteors should be easy to spot. Low pressure spinning over the Great Lakes Friday morning will lift near Milwaukee, WI tonight and into Michigan by Saturday. Showers will continue through the evening under cloudy skies before a ridge of high pressure moves in. Skies will become partly cloudy Saturday with temperatures remaining cool, but warmer than what they've been the past two days. By Sunday a warm front will lift north adding about 10 degrees to the forecast high for the afternoon. A little more cloud cover may move in Sunday night as gulf moisture lifts north on a southerly wind. The warm front will become stationary over southern Wisconsin leaving a little unsettled weather pattern for next week. Thursday morning the Climate Prediction Center released its 2012/2013 Winter Outlook consisting of a three month period running from December through February. I was able to participate in a conference call with Mike Halpert, Deputy Director of NOAA Climate Prediction Center, and Deke Arndt, Chief of Climate Monitoring at NOAA's NCDC, this morning and we had an interesting discussion on this upcoming winter. With the exception of last year the previous winters have been fairly snowy and cold. Going into this winter season and trying to predict what will happen during that three month time period has been a little more challenging for forecasters. Earlier this year it appeared as if the La Nina pattern we were in was going to weaken and ENSO neutral or even weak El Nino conditions were going to develop; meaning sea surface temperatures were beginning to warm. A few months ago it looked as if that pattern was beginning to pan out. Sea surface temperatures along the equitorial Pacific were beginning to warm signaling a shift into an El Nino pattern. However, earlier this month the development of El Nino came to a halt resulting in a very unique situation because something like that hasn't really happened over the 60 year climate period forecasters had been looking at. This in itself poses a challenge when trying to predict what will occur during the winter months because there are no real past cases to rely on. A theory as to why this may have occured is there was possibly no true interaction with the atmosphere and sea surface temperatures. Another challenge for forecasters has been the shift from the 1971-2000 climate period to the 1981-2010 climate period. We've lost our 'base period', so to speak, with trying to forecast seasonal outlooks causing the trend signals to be lost. There have been, however, some signals pointing to a possible redevelopment of those conditions based upon the forecasting outlook models and earth system models. So, what does this mean for temperature and precipitation across the U.S? The persistent warmer than normal conditions will likely continue across the Plains and further west with cooler than normal temperatures in Florida. Closer to home there is about a 50/50 chance that we may end up either warmer or colder than average. For precipitation, there is a 33% chance that extreme northwest Illinois and the Midwest will end up drier than average along with the Pacific Northwest. It's important to realize when forecasting these outlooks they are probabilistic and not guaranteed. Just take last year for example. The winter was forecast to be a cold and snowy winter but ended up being fairly warm and dry. There are other teleconnections we have to look at that will also play a role in what this winter has in store. For example, the Arctic Oscillation. Unfortunately the skill level in predicting that months in advance just isn't there and this is a phenomenon that we can usually forecast only a few weeks in advance. An interesting feature that was pointed out by someone from USA Today was the high confidence in above average temperatures for the north slope of Alaska. Sea ice is at its record low and it's possible this may have a small impact on the weather for the lower 48. It will be critical to see how that will interact with the Arctic Oscillation this year. What?!? Graupel may be a meteorological term you haven't heard too often, but that's exactly what may be mixed in with those showers later this afternoon. The strong low pressure system moving through Minnesota and Wisconsin this morning will become a little more centered over southern Wisconsin and northern Illinois this afternoon and evening. The temperatures above associated with the low are very cold compared to mid-October normals. When very cold temperatures are present several thousand feet above the surface it can sometimes increase the instability in the atmosphere. We tend to see this a little more on days after a cold front has passed and the day starts out with sunshine but then ends cloudy with instability showers forming. The showers that develop are caused by the rapid upward movement of the air. A similar scenario may play out this afternoon (minus the sunshine) with what's known as graupel. Snowflakes form high in the clouds due to well below freezing temperatures. When those snowflakes encounter supercooled water droplets (yes, liquid can have a temperatures below freezing and still remain liquid instead of freezing) it causes the water droplet to quickly freeze into small ice pellets. This process is different than what's needed to cause sleet because sleet forms when there is a thin, warm layer above the surface of the earth causing the frozen precipitation to partially melt before falling into a below freezing layer at the surface. There will not be a warm layer present above the surface today and tomorrow. So, if there are tiny frozen things falling from the sky later this afternoon you now know what it is. 12:45pm Update: Scattered showers and thunderstorms have developed as the first round of warm/moist air moves north out of Missouri. I expect this activity to reach the Rockford area within the next hour or two and continue to remain scattered throughout the afternoon. As the cold front moves through there are greater indications that heavier rain and thunderstorms will develop near the Mississippi River and move east through midnight. This image is the RAP, Rapid Refresh, model used for short term forecasting. The time frame here is at 7pm this evening just as the cold front is moving east of the Mississippi River. As I discussed in a previous post the front will be moving through the same time the upper level low is strengthening and a second slug of moisture lifts north. Very strong winds within the jet stream will round the base of the upper level low and help enhance lift (cause air to rapidly rise) in the atmosphere. This process will allow for intensification of a line of showers/thunderstorms around 7pm over northern Illinois and southern Wisconsin. While severe weather isn't anticipated some of the storms that do move through will have a lot of energy and momentum to work with which could produce wind gusts at the surface over 50 mph. Rainfall totals also appear to be quite impressive with totals near an inch or more across the area by Thursday morning. Update: Currently looking through some of the latest data regarding the storm system for this evening and some of the shorter term models are suggesting a significant band of convection developing near sunset and lasting into the overnight. Details to come soon. Stay tuned! Another round of some much needed rainfall may be on the way this evening and overnight as a strong cold front moves through. While moisture from the Gulf of Mexico won't be in full supply with this next system we may make up for that with the amount of lift, or rising air and energy, in the atmosphere. Clouds will continue to increase this morning with skies becoming mostly cloudy by noon. Temperatures will rise near 70° ahead of the front before dropping back into the low 60s by dinner. Rain will begin to overspread northern Illinois and southern Wisconsin around 3pm and continue into the overnight. The front will move through between 6pm and 7pm at the same time the upper level low will strengthen. These two things combined should be able to generate enough lift in the atmosphere for heavy rain and embedded thunderstorms to form and persist into the overnight. Rainfall totals from tonight could top an inch or more for some before the low lifts northeast into New England this weekend. Severe weather isn't anticipated but as showers and storms form the amount of energy in the atmosphere could cause some thunderstorms to produce gusty winds. Two low pressure systems will impact our weather with the first beginning later this afternoon and evening. The second low will have a greater impact on the weather in the Great Lakes as it comes through late Wednesday. A weak area of low pressure is currently moving into Iowa and will swing through northern Illinois after sunset tonight. Warm air moving north ahead of the low has produced a few light showers across northern Wisconsin and Minnesota. As the low moves closer this evening it may generate enough lift in the atmosphere to produce a few showers and even a thunderstorm or two in northern Illinois. Instability remains fairly weak with limited moisture flow from the gulf but don't be surprised if a shower or two develops later this afternoon. The bigger of the two systems will quickly move out of the Pacific Northwest and into our direction early Wednesday with winds in the jetstream racing southeast around 130 knots (150 mph)! This will allow for another low pressure system to develop across the High Plains and move into the Great Lakes by late Wednesday night. A cold front will sweep through the Stateline between noon and 6pm Wednesday bringing with it the threat for showers and thunderstorms. Right now, the severe threat doesn't appear to be too great across the region because gulf moisture won't have enough ample time to set up and move north. This system will, however, have a little Pacific moisture to work with so there may be a few bouts of heavier rainfall as the front moves through. Another limiting factor to the severe potential Wednesday is the fact the system will begin to occlude as the upper level low moves directly overhead the surface low. This limits the amount of lift in the atmosphere to generate thunderstorms. Now, even though the gulf moisture is limited and the surface low remains detached from the cold front the jetstream winds will continue to be strong so this could get a few stronger storms to build; especially to the south in central and southern Illinois. This powerhouse of a system has now just moved onshore in the northwest so with the model data this morning and especially the data this evening we'll have a better handle on exact timing and placement of this storm. As Meteorologist Brandon Arnold mentioned in a previous post temperatures will tumble behind the front with highs Thursday and Friday in the low 50s. The low will remain fairly stationary through the end of the week keeping the cloud cover and scattered showers through Friday evening. A strong area of low pressure will move in later this week, bringing quite a few changes with it. Tuesday will be breezy and mild ahead of the system, with highs right around 70 degrees. A late day cold front on Wednesday will be the beginning of our changes. Rain are a few thunderstorms are likely Wednesday evening before a big blast of cold air moves in for the rest of the week. Here's a look at the surface map for Thursday. Winds will stay windy on the back end of our cold front as cold Canadian air spills in for the northwest. But it's more than just at the surface. Cold air aloft will be around the freezing mark on Thursday and Friday. Why is this important? Colder air aloft means the atmosphere needs less energy for things like pop-up showers. Air this cold can even lead to small hail and cold air funnel clouds. Don't worry, since we are talking cold air, the severe threat is pretty low. If you weren't awake before...you are now!